The scene at the junction of Artillery Place and John Wilson Street which has become a shrine to Drummer Lee Rigby, who was murdered on Tuesday afternoon. BRITAIN’S INTELLIGENCE SERVICES have come under pressure this morning to explain their knowledge of two Islamists suspected of hacking a soldier to death in London, amid claims they had tried to recruit one of them. Michael Adebolajo, 28, and Michael Adebowale, 22 – who remain under armed guard in hospital after being shot by police at the scene – were known to the intelligence services but were reportedly assessed as not posing a deadly threat. An alleged friend of Adebolajo was arrested at the BBC after telling the broadcaster that British security services had tried to recruit the murder suspect. Abu Nusaybah told BBC television on Friday that Adebolajo was asked by the MI5 domestic intelligence agency if he knew certain individuals and later if he wanted to work for them. He said Adebolajo had snubbed their approach. The BBC said Abu Nusaybah was promptly arrested on their premises after giving the interview. Today’s Daily Mirror front cover. Scotland Yard police headquarters said counter-terror officers had arrested a 31-year-old man in London on suspicion of the “commission, preparation or instigation of acts of terrorism”. It is understood the arrest was not directly linked to the brutal murder of soldier Lee Rigby, who was hacked to death in broad daylight Wednesday outside the Royal Artillery Barracks in Woolwich, southeast London. Rigby’s distraught wife said the family found it hard to accept that the 25-year-old had been killed not in a war zone but on the streets of his own country. 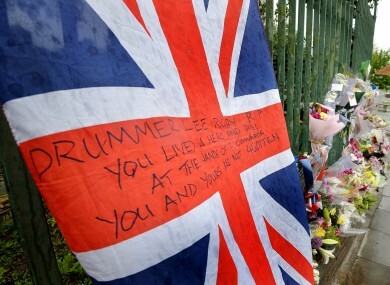 A huge pile of floral tributes is still building up outside the barracks. A Police forensics officers removes evidence from a flat at Macey House, in Greenwich, south east London, where Michael Adebowale, 22, is registered as a voter. More details emerged overnight about Adebolajo, who was born to devout Nigerian Christians but converted to Islam a decade ago and had attended meetings of the extremist group Al-Muhajiroun, which is now banned in Britain. He had reportedly sold inflammatory literature at a stall in Woolwich, where his increasingly extremist behaviour in recent weeks had alarmed other Muslims. Reports said Adebolajo had attempted to travel to Somalia to fight alongside Al-Qaeda-linked Shebab insurgents but had been turned back and had his passport confiscated by police. Abu Nusaybah told BBC television that Adebolajo had been picked up by Kenyan forces and physically assaulted in detention there. Shortly after he returned, MI5 agents repeatedly called at his home, the friend alleged. “His wording was: ‘They are bugging me – they won’t leave me alone’,” he said. “After him saying that he didn’t know these individuals and so forth, what he said is they asked him whether he would be interested in working for them. He was explicit in that he refused to work for them. Adebolajo was captured on film shortly after the attack brandishing a bloodied knife and meat cleaver and claiming he had killed the soldier because British forces killed Muslims every day. Less is known about the other suspect but he is also believed to be of Nigerian origin. Dramatic footage of the incident obtained by the Daily Mirror newspaper also showed Adebolajo charging at armed police before he was shot and injured. As detectives tried to establish how Adebolajo apparently went from an outspoken convert to a killer, the government was forced to defend the security services against criticism they missed signs which might have helped prevent the grisly murder. A parliamentary committee will look into the role of the security services, but communities minister Eric Pickles said even if the men had been known to intelligence agencies, it was impossible to keep tabs on everyone all the time. Police released two women they had arrested as part of the investigation on Thursday although a 29-year-old man remained in custody on suspicion of conspiracy of murder. Omar Bakri Mohammed, the founder of the Al-Muhajiroun movement which was banned in Britain under anti-terror laws, told AFP from Lebanon that he recalled Adebolajo as a “very shy” young man who regularly attended his public talks when the preacher lived in London. Bakri refused to condemn the soldier’s murder. “I don’t condemn his actions because he attacked a young British soldier. But I can say to the Muslims in the UK you are not allowed to live among people and then go and kill them because Islam does not permit you,” he said. Faith leaders in Britain joined together to condemn the murder and hailed the cohesion of different religions in response to the attack. Email “Spy agency MI5 'approached' suspect soldier killer, says childhood friend”. Feedback on “Spy agency MI5 'approached' suspect soldier killer, says childhood friend”.